Many of the people stumbling out of work and into 30 degrees heat this week will more than likely be thinking of rounding off the working day with a palate-scraping Spritz. Intrinsically Italian, this classic aperitivo treat is particularly associated with the deep red, bittersweet drink, Campari. 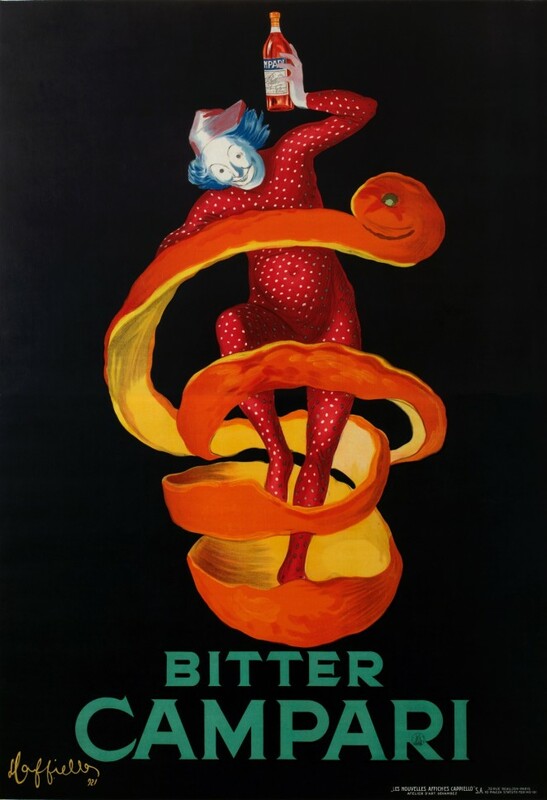 And an exhibition of the striking adverts for this iconic beverage are on show from this week onwards at the Estorick Collection in London. Aperitivo culture dates back to the nineteenth century in Italy, when bars began experimenting with mixing their house drinks, to produce their own particular combinations of bitterness, herbal flavours and sweetness. In the 1860s, a café owner from Milan named Gaspare Campari, started to promote and sell his own successful blend on one very important condition: bars had to display a metal Campari Bitters sign in the window. 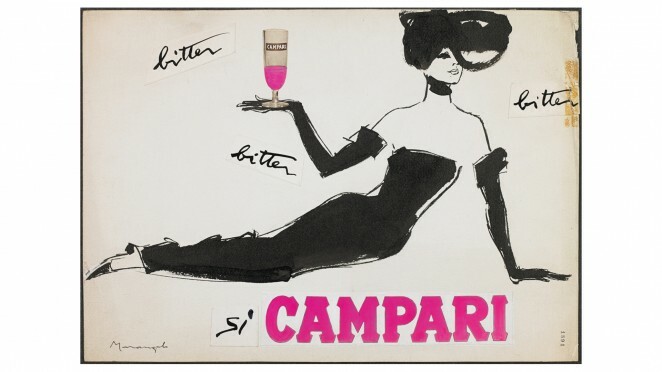 Since then, Campari has created some of Italy’s most distinctive and eye-catching publicity – and this exhibition will show a wide breadth of that imagery, loaned from Campari’s archives in Milan. Taking us from the Belle Epoque to the 1960s, there will be original lithographs, posters, ads and packaging designs that have made this one of the world’s most elegant and powerful brands. 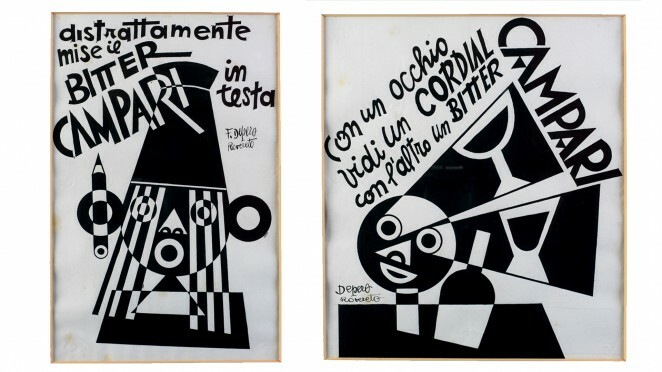 With the advent of futurism, Fortunato Depero’s bold, monochrome ads from the 1920s showed how the publicity always mirrored trends and movements in the art world – indeed, for many artists, poster design was a way to make a living. 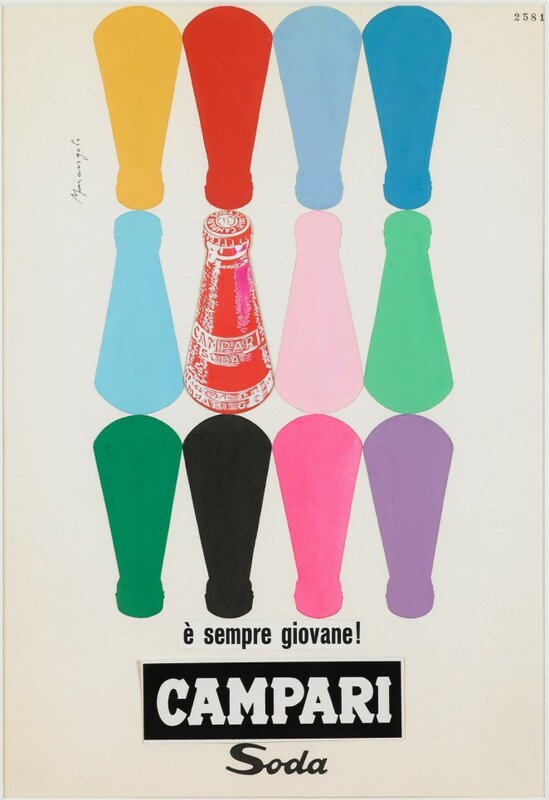 Similarly, post-war designs by artists such as Franz Marangolo and Bruno Munari reflect the influence of pop-art – using the style of mass-produced screen prints to publicise mass-produced products. As well as this striking publicity, the exhibition brings together all manner of Campari ephemera – a giant bottle top that doubles as a clock, ancient wooden crates, and even some of those early enamel signs that were the starting points for one of the most iconic and celebrated Italian brands. This entry was tagged Campari, Estorick, Futurism. Bookmark the permalink.